The article is a review of several of Craig Purdam’s presentations on tendinopathy at the recent 2011 Pan Pacific Conference for Medicine and Science in Sport, held in Honolulu. Craig is the head of physical therapies for the Australian Institute of Sport. are suggested rather than starting with eccentric loading. This is a concept that I have posted on previously (click here to see the post) noting that the use of P.A.I.L’s (Progressive Angular Isometric Loading)™ should be utilized prior to imparting the stresses involved with eccentric loading. Clinically I concur with what Mr. Purdam is presenting in that with early tendon problems, it is important not to contribute to tendon overload (ie. eccentrics) but to promote proper tissue growth. 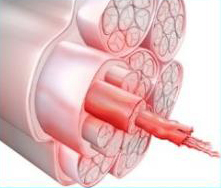 You will also note that with what he refers to as “Tendon Dysrepair,” part of the pathology involves matrix disorganization and collagen separation leading to what he refers to as ‘failed attempt at healing.’ With progressive isometric loading, we can promote new collagen growth while simultaneously allowing tissue to be laid down along the lines of stress (the premise for P.A.I.L’s™) thus avoiding the progressing to this stage of tendon pathology.